Baby's settling into sleep cycles, snoozing about 12 to 14 hours a day. 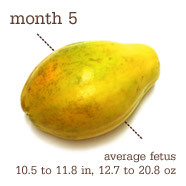 We will stay at the size of a papaya for a few weeks now, as you can see there is a range for sizes. Gender: It's a baby GIRL!!! Best Moment this Week: I guess just feeling her move each day. It's a sweet little reminder that she's always with me. Well, here it is...it's horrible lighting and super washed out, but here is a picture of my belly at 22 weeks. I look terrible, but Baby Girl is the star of the picture and we just wanted you to be able to see her. Baby Girl and her Momma look very healthy - yea! !